Choose from 940 hotels and guest houses in Scotland. Shown below a just a selection of the hotels available. To search within an area please use the menu on the right. With a superb quiet location in a Highland forest near Falls of Foyers waterfall, Craigdarroch House has open log fires and stunning panoramic views of Loch Ness. Craigdarroch House has a restaurant in which you can savour a candle-lit dinner in the dining room, with views of the loch and the hills beyond. Bar meals are served all day. The lounge bar has a fine malt whisky collection of 130 whiskies. Relax with a book or watch the wildlife in the surrounding woodland from the comfort of the hotel's conservatory. On the hillside above Loch Ness, Craigdarroch House is great for guests who want to stay in an area of outstanding natural beauty and explore the Highland area. The Royal Marine Hotel overlooks the mouth of the River Brora and offers calm, gracious surroundings, great food, leisure facilities, log fires and a Highland welcome. In addition to the leisure club, you can enjoy boats on Loch Brora, mountain bikes, and an adjacent 18-hole golf course. The golf course and beach are 1 minute away. The house was designed in 1913 by Sir Robert Lorimer and the original woodwork and antique furniture are still in place. 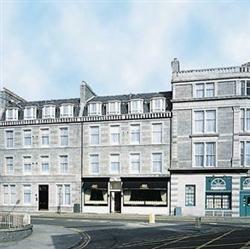 The Station Hotel is located in Aberdeen city centre, opposite the railway station, with onsite parking available. 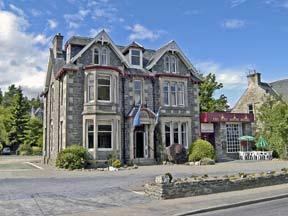 Part of the Cairn hotel group, we offer spacious and comfortable bedrooms and an excellent restaurant. Guests may enjoy a host of city attractions, including shops, entertainment and a vibrant nightlife. The hotel can also facilitate conference and banqueting needs in a choice of 6 versatile conference suites supported by excellent facilities. Offering modern accommodation, the Holiday Inn Express, Hamilton has been created for value and comfort, whilst offering free Wi-Fi in public areas. Opened in May 2007 and rebranded in 2009 to the new Holiday Inn Express style, the hotel has 104 bedrooms and 3 meeting rooms. 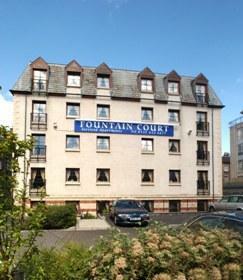 With a prime position in Hamilton town centre, the hotel is ideally located within a 2-minute drive of the M74. There is a buffet breakfast where you can eat as much or as little as you like from the wide selection. In the evenings, relax in the Great Room Bar. At the Holiday Inn Express Hamilton, staff aim to make your stay a pleasant and enjoyable experience. The hotel prides itself on its vibrant, friendly approach; you are made to feel at home as soon as you arrive. This luxury accommodation is set amid the spectacular scenery of some of Scotland's most beautiful, unspoilt areas. Colquhoun's restaurant has 2 AA Rosettes. The Lodge on Loch Lomond Hotel is surrounded by natural beauty. Many rooms and the restaurant offer undisturbed panoramic views of Loch Lomond. The restaurant uses fine, fresh local produce and has a terrace over the water. The hotel is 30 minutes away from Glasgow. Situated in picturesque Stornoway, 4-star family-run Holm View Guest House is on the east coast of the Hebridean Isle of Lewis, a short journey from the ferry terminal and airport. Holm View Guest House offers comfortably furnished, spacious rooms, all with a satellite TV and sound system. Some rooms have panoramic views and free Wi-Fi internet access is available. There is also separate cottage accommodation. The guest house has a tranquil position, with stunning views towards the Isle of Skye. The surrounding area boasts spectacular beaches and beautiful scenery. An excellent breakfast is included, served by the friendly, helpful staff and a continental breakfast is served in the cottage. Local leisure pursuits include golfing, fishing and windsurfing. Its location, spectacular views, stylish comfort, personal service and true Scottish hospitality combined with cuisine to die for make this a hotel to surpass your expectations. With 22 beautifully stylish rooms, St Andrews Golf Hotel is a perfect size for the discerning guest. It is large enough to provide excellent service and hospitality, but small enough to really care. 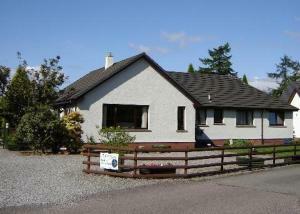 It is only a short distance from the famous Old Course golf course. Grove Street is a quiet one way street, tucked discreetly away in the west end of Edinburgh. Here you can choose from 1 or 2 bedroom, modern, serviced apartments, each one offering you your own city pad. The open plan lounge has twin sofas, and a generous dining area. The fully fitted kitchen is ideal for preparing your own meals - or dishing up that tasty takeaway - and comes complete with the all-important dishwasher. The two bedroom apartments have a choice of configurations: double/twin, twin/twin or double/single. The one bedroom is nice and simple: it has a double. In the lounge, our cable TV and CD player will keep your eyes and ears happy for days. The Bridge of Orchy hotel sits on the A82 which is the main route to the Highlands and Islands of Scotland. The train station which is only minutes walk from the Hotel is served daily by trains from London, Glasgow and Fort William. The Hotel has become renowned for its fine cuisine and real hospitality, it is surrounded by some of Scotlands finest scenery including several munros, loch and river fishing, skiing, distilleries and breweries and of course the famous bridge itself. There are 4 golf courses nearby. Offering the option of luxury in our 10 en-suite hotel rooms or more rustic accommodation in our bunkhouse with rooms of 2, 3 or 7, we cater for all walks of life. So whether you are an outdoor enthusiast, looking for a break away from the hustle and bustle or even a stop over on your way North or South we offer something for everyone. 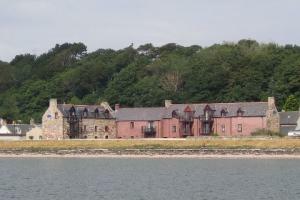 The MacDonald Crutherland House Hotel is a superior first-class hotel. The hotel is located on 37 acres of grounds close to all major routes for business and tourism. This is an excellent four star hotel set in tranquil grounds offering an excellent standard of accommodation and full leisure facilities. All the public areas are furnished to a very high quality standard and the staff are friendly and efficient. The hotel is perfectly located for exploring the Clyde Valley and only 20 minutes from Glasgow city centre. Beside Annanhill Golf Club, this Premier Inn hotel is an easy drive from the A71 road and Kimarnock town centre, with free parking, family-friendly rooms and an on-site Brewers Fayre restaurant. Some rooms can take 2 adults and up to 2 children (under 16 years). The 2 children also get a free full breakfast when accompanied by an adult eating a full breakfast. The full all-you-can-eat breakfast has the expected cooked items, including vegetarian sausages, as well as a wide continental selection. This award winning 3-star Victorian hotel sits at the heart of the Cairngorm National Park, amid the magnificent scenery of the Scottish Highlands With a bar and restaurant, the hotel is 15 minutes south of Aviemore, and lies within a 20 mile radius of 10 championship golf courses including Boat of Garten, Newtonmore, Nairn and Kingussie. The hotel is recommended by several leading hotel guides including Michelin, AA Hotel Guide, Les Routiers and Travellers' Scotland. It is the perfect touring base from which to explore the whisky and castle trails, the River Spey, the Cairngorm Mountains or simply enjoying the stunning scenery and rich wildlife. Enjoy comfortable rooms, outstanding meals and a friendly and relaxing atmosphere. Following a major refurbishment, rooms feature new en suite bathrooms. King-size rooms now have whirlpool baths and bathrobes provided for your comfort. In the heart of Aberdeen's city centre, these stylish and contemporary serviced apartments offer luxurious accommodation, free Wi-Fi, a continental breakfast and a welcome hamper. City Wharf Apartments have two locations, both of which are within 5 minutes' walk of the city centre and its restaurants, cinemas, pubs and shops. The first location is on the quayside of the city's historic harbour, with stunning views over the water. 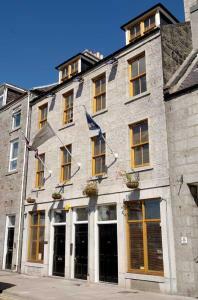 The second is located a few minutes to the south of Aberdeen's main shopping precinct, Union Street. Attractive and modern, the apartments were fully refurbished in 2007 and are redecorated annually. Each apartment has a modern, fully fitted kitchen with a Smeg dishwasher, a fridge freezer and a washer dryer. The lounges boast plasma flat-screen TVs, DVD players, Hi-Fis, leather sofas and dining areas. The bathrooms have under-floor heating, free toiletries and power showers. Some apartments have jacuzzi baths, saunas and steam rooms. In the heart of the beautiful Cairngorms National Park, Macdonald Aviemore Highland Resort offers luxurious rooms and facilities, overlooking the breathtaking scenery of the magnificent Cairngorm Mountains. Guests will enjoy access to the extensive facilities in the Leisure Arena, including the Technogym, swimming pool, Jacuzzi, sauna, steam room, children's activity centre and Vital Beauty Spa. Macdonald Aviemore Highland Resort offers luxurious and well furnished rooms, with en suite facilities, a TV and a DVD player. There is a range of dining options in the hotel, including fine dining in Aspects Restaurant or a snack in the Leisure Arena. The cosy Laggan whisky bar has a relaxing lounge, with a TV and DVD player. Leisure pursuits in the area include skiing, climbing, white water rafting or golfing at the excellent Spey Valley Championship Golf Course. Boasting fantastic views over Ben Nevis and the Nevis Range of mountains, this small, family-run B&B is set in the rural village of Torlundy, just 3 miles away from Fort William. Your hosts, Michael and Maxean, aim to make your stay at Mayfield comfortable, relaxing and enjoyable. They will be on-hand to help and advise you on how to get the best from your stay in the Highlands, they can even provide suggested tour guide information for you. Mayfield is a bungalow, so there are no stairs inside, however there are 4 steps up into the house. If you have difficulty with steps, please contact the house prior to making a reservation to discuss suitability as there are no disabled facilities. Close to the train and bus stations, Aberdeen Douglas Hotel has a central location, comfortable bedrooms and a free Wi-Fi internet connection. Built in 1856, the Douglas Hotel is one of Aberdeen's oldest hotels, making it a much loved and well appointed landmark in the city centre. It is just 500 metres from the main shopping centre. Aberdeen Douglas Hotel is home to Molly's Bistro Bar, which serves food and drink all day. The local area has a wide variety of attractions, including 30 golf courses, whisky and castle trails, and nightlife. Set within a traditional terraced townhouse in the centre of Glasgow, this cosy guesthouse provides an excellent base from which to enjoy all that the city has to offer. Just yards away from the Charles Rennie Macintosh inspired Glasgow School of Art, the Alba Lodge is well situated for shopping, sightseeing and the city's bustling nightlife, including theatre trips, evening dining and numerous bars and clubs. The Alba also offers excellent transport links to the SECC, Glasgow Airport, the West End and other parts of the city, making it the perfect for both business and leisure travellers. The Salutation Hotel is situated in the heart of the historic city of Perth, the gateway to the Highlands. The hotel is a minute's walk from shops, as well as the theatre, concert hall and the beautiful River Tay. Perth is a mere 45-minute drive from Edinburgh and 50 minutes from Glasgow. There are daily scheduled flights into Edinburgh and Glasgow and excellent rail links from all major cities. The Salutation has excellent facilities and together with a professional approach, friendly, caring staff and a willingness to please, we feel that we can offer you a welcome to match any hotel in the UK. The hotel has a lovely relaxing bar to unwind in after a day's shopping and with only a minute's walk from the shops, concert hall and theatre, the hotel is ideally situated. The restaurant on the first floor enjoys a fine view of one of Perth's best shopping streets through the Adam Window. 2 disabled rooms were created in 2005 along with the refurbishment of a further 15 rooms. In January, the Moncrieffe Suite enjoyed a 100,000 GBP refurbishment. Just a 30-minute drive from Edinburgh, this former coaching inn is set in Kinross, in the historic heart of central Scotland, with easy access to the M90 motorway. Now a first-class hotel and golf course, ideal for both business and leisure, the Green Hotel features modern, spacious bedrooms. Each bedroom is well appointed and overlooks the hotel's extensive gardens and beautiful courtyard. You can use Gravity Health & Leisure Club at the sister hotel, the Windlestrae, located just across the road. Facilities include a swimming pool, sauna, steam room, jacuzzi and multi-purpose gym with weights and cardiovascular equipment. There are also two 18-hole golf courses with special rates and preferred tee times for residents. In the highlands of Inverness, Trafford Bank is a stylish boutique guest house, with AA 5-star status. Inverness Rail station is just a 3-minute drive away. Each beautifully furnished room features a flat-screen TV, a DVD player and a CD player. There is also a Bose iPod docking station and a DAB radio. Some rooms have a luxurious roll top bath. An inclusive full English breakfast is available. Staff are friendly and welcoming. Relax in the picturesque mature gardens at Trafford Bank. Free Wi-Fi internet access and free parking are provided. This comfy, refurbished Victorian guest house is 5 minutes from the town centre. The racecourse, seafront and Ayr River Walk are within walking distance. 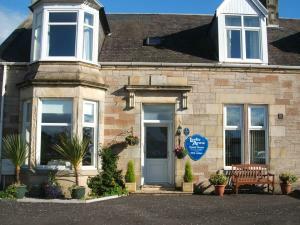 Leslie Anne Guest House is a 5-mile drive from Prestwick Airport and less than 5 minutes from Ayr Railway Station. The station has a 10-minute direct link to the Airport and a 50-minute service to Glasgow. All rooms are en suite and have free Wi-Fi access. Ground-floor rooms are available, and there is private car parking in front of the guest house. Full cooked Scottish breakfast or continental breakfast is offered. A take-away picnic breakfast can be provided for early departures. 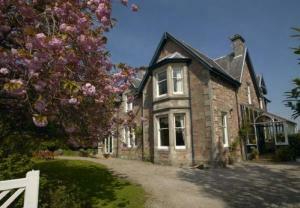 Leslie Anne Guest House is rated as 3-star B&B by Visit Scotland. 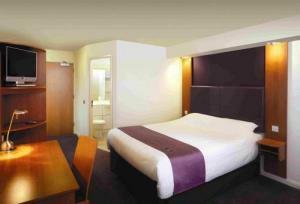 Skene House Holburn is an all-suite hotel with a great city-centre location. The 1 and 2-bedroom suites are perfect for business or leisure. At Skene House you will find a breakfast room and an honesty bar, and you will receive a free drink on your arrival day. Each suite has self-catering facilities for your independence and convenience. Glenan Lodge is a traditional country house with private fishing in a village location just 15 miles south of Inverness and 15 miles north of Aviemore on the main A9. We are fully non-smoking. We have a comfortable guest lounge with video, DVD and games, a homely dining room and licenced bar. Home cooked evening meals are available by request. We even have visiting red squirrels. Glenan Lodge is ideally situated for walking, fishing, cycling, bird-watching, shooting or just touring the Highlands. There are also many excellent golf courses within 1 hour of the guest house with Carrbridge and Boat of Garten less than 30 minutes away. We are happy to welcome your children over 5 years of age - sorry no infants under 5. 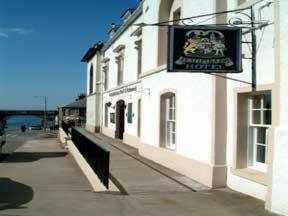 One the finest and most popular hotels on the Moray Firth Coast, Scotland. Full of character and charm which sits so well, peacefully and calmly, with the qualities of its surroundings. 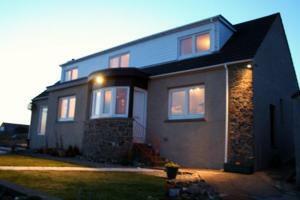 Conveniently situated on the beautiful Moray Firth coast, mid way between Aberdeen and Inverness. In a class of its own for short breaks and weekend escapes in Scotland. A romantic and relaxing setting away from the hustle and bustle of everyday life. Come and spend some time with us and experience delicious cuisine and a fine glass of wine from our extensive list. Just a short stroll from Prestwick town centre, this elegant Victorian townhouse provides stylish accommodation with convenient access to Glasgow Prestwick Airport and the M77/A77 Glasgow Road. Boasting a fusion of modern comforts with period features, The Hollies is a chic B&B enjoying excellent transport links around Prestwick and Ayrshire. In addition to the airport and main roads, Prestwick train station is just a 2 minute walk away. An ideal base for golfers, the Hollies is just a 2 minute walk from Prestwick Old Course, the birthplace of The Open, and a 10 minute drive from Royal Troon, the Open Championship course.